The Audi R8 GT will now soon roll down the streets with a Spyder version. With its limited release of Audi R8 GT Spyder, Audi group is expecting to fire the market and why not, with the glimpse to the model and performance specs we too expect the same. Model is mounted with the powerful V10 Engine and this in itself defines the rest of the story. So now with Audi R8 GT Spyder 2012 the buyers will have performance and classic looks. Let us see more into the Audi’s new version to R8 GT. The 2012 Audi R8 GT Spyder interior looks much concentrated upon lowering the weight of the model and no doubts they succeeded in it by bringing the 85 kg lighter version than the predecessors. The Black painted interior elements are then contrasted with a choice of gray or crimson. Alcantara Upholstery covers the windshield, Seats and steering wheel; however customers are also availed with the option for Nappa Leather. The model includes some of the interior standard features like, navigation system plus, alarm system, driver infotainment system and an automatic air conditioning system. Buyers will also be availed an option to go for a sophisticated sound system manufactured by Namg and Olufse, and a Bluetooth interface including a seatbelt microphone. The Exterior of Audi R8 GT Spyder gets more aggressive with additional parts in contrasting titanium gray. The Audi R8 GT Spyder is adorned with a front splitter with a dual lip giving it sporty look. The model also has flics at the sides of the front bumper, red GT Badges giving it attractive look. At the rear of Audi R8 GT Spyder are round exhaust tailpipes, an enlarged diffuser, which undoubtedly brings dominant looks accompanied well by Dark LED taillights in a clear glass design. 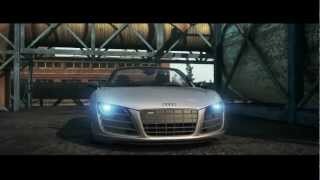 Audi R8 GT Spyder holds the same 5.2 liter V10 engine that in coupe. The engine is mated to six speed automated R tronic transmission with two fully automatic modes. The version also comes with manual mode offering the driver to shift gears with the help of paddles mounted on steering. This indeed makes the drive smooth, safe and performance oriented. The Audi R8 GT Spyder comes with Quattro permanent all wheel drive system offering additional torque to the front axle. The model also comes with the suspension system that includes aluminum double wishbones locating the wheels providing good contact with the road at high speeds. As far as price of Audi R8 GT Spyder is concerned the announcement says it’ll be available at over $ 210,000 (excluding delivery fee) for the US market, while for the German market it is expected to pitch the roads at around 207,800 Euros (approx $300,000). As far as competition is concerned the Audi R8 GT Spyder will have to battle with Ferrari 458 Italia and Mercedes SLS AMG to prove its existence.